Here on Earth we can use water to put out most fires, both because it helps prevent easy contact withoxygen in the air and reduces heat via rapid evaporation. 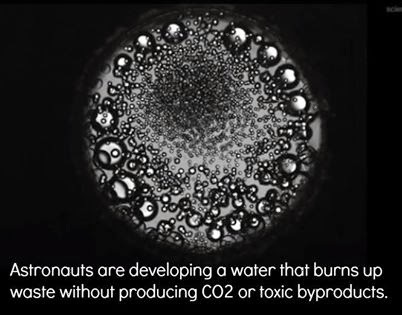 But astronaut researchers on board the International Space Station (ISS) are working to develop a special kind of water that actually makes things burn — except without the flame part. ANALYSIS: Cool Flames: Playing With Balls of Space Fire Called supercritical water, this exotic substance is neither a solid, liquid, nor gas but rather a “liquid-like gas.” Made by compressing ordinary liquid water to 217 times the air pressure found at sea level and heating it above 703 degrees Fahrenheit (373 degrees Celsius), supercritical water rapidly oxidizes any organic substance it comes in contact with — in other words, it burns it.Read More..